Dr. Tiffany McCormack provides an overview of tummy tuck options and reveals what she believes to be one of the most rewarding aspects of the procedure. Reno, NV — According to the most recent statistics released by the American Society for Aesthetic Plastic Surgery (ASAPS), abdominoplasty is the fourth most popular cosmetic surgical procedure performed in the United States. Commonly called tummy tuck surgery, this body contouring method is utilized to remove excess skin and fat in the abdominal region as well as to tighten loose abdominal muscles that have been stretched out due to pregnancy and/or significant weight fluctuation. At her practice, Dr. McCormack offers two abdominoplasty techniques – mini tummy tuck and full tummy tuck – both of which may include some degree of liposuction depending on the patient’s needs. Regarding the difference between a mini tummy tuck and a full tummy tuck, she says the former is generally performed “when loose abdominal muscles and a minimal amount of excess skin are confined to the lower abdomen” whereas the latter is typically employed when these indications are present both above and below the belly button. Though both procedures involve the excision of excess skin and tightening of abdominal muscles, she notes that a full tummy tuck is often considered more extensive and may require a longer incision. Regardless of the incision length, Dr. McCormack says potential tummy tuck scars can generally be concealed by articles of clothing, including many bikini and underwear varieties. Furthermore, the Reno plastic surgeon reveals that abdominoplasty scars can often be incorporated into a previous cesarean section scar, should one be present. To help diminish the appearance of scarring, she advises patients to rest and limit strain/tension on the abdominal region throughout the healing process. 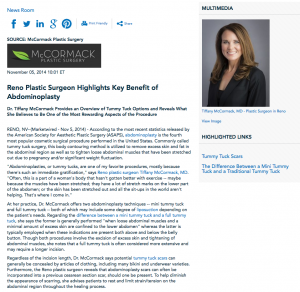 Dr. McCormack is a board certified plastic surgeon in the Reno-Lake Tahoe area. In addition to being a Fellow of the American College of Surgeons, she maintains active membership in the American Society for Aesthetic Plastic Surgery and the American Society of Plastic Surgeons. At her private practice, Dr. McCormack offers a comprehensive span of cosmetic treatments and procedures ranging from facial rejuvenation and breast enhancement to body contouring and medical-grade skin care. She is available for interview upon request. For more information, visit plasticsurgeryrenotahoe.com, mommymakeoverreno.com, and plus.google.com/+TiffanyMcCormackMD/about.